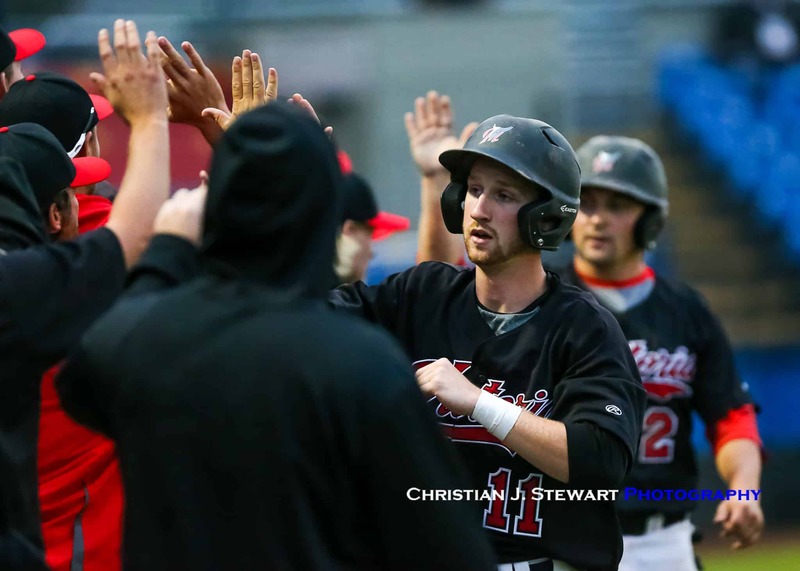 August 25, 2018, Victoria, BC – A two-out, three-run home run by Victoria’s Lanny Burrows highlighted a eight-run top of the sixth inning and helped the host Mavericks overcome a 4-2 deficit and defeat Quebec 11-5 in quarter-final action Saturday night at the 2018 Baseball Canada National Championship at Wilson’s Group Stadium at Royal Athletic Park in Victoria. The win moves Victoria into the semi-finals against the Tecumseh Thunder (Ontario 1) at 9:00 am on Sunday at Wilson’s Group Stadium and sends Quebec home disappointed, after finishing the round robin 3-1 and defeating Alberta earlier in the day to get into the quarter-finals. 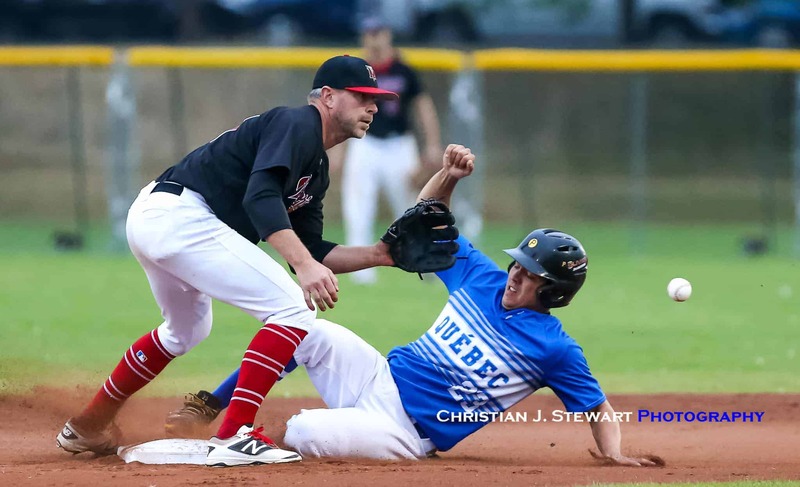 New Brunswick (the Moncton Fisher Cats) also advanced to the semi-finals, posting a 6-1 win over the Ilderton Red Army (Ontario 2) in Saturday night’s second quarter-final game, played at Lambrick Park. 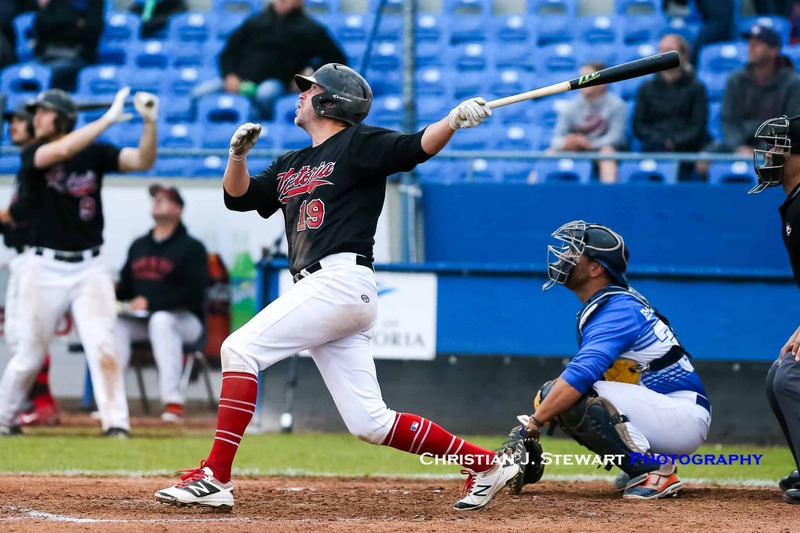 New Brunswick will now face British Columbia (the Coquitlam Angels) in Sunday’s second semi-final, scheduled for 12 Noon at Wilson’s Group Stadium. 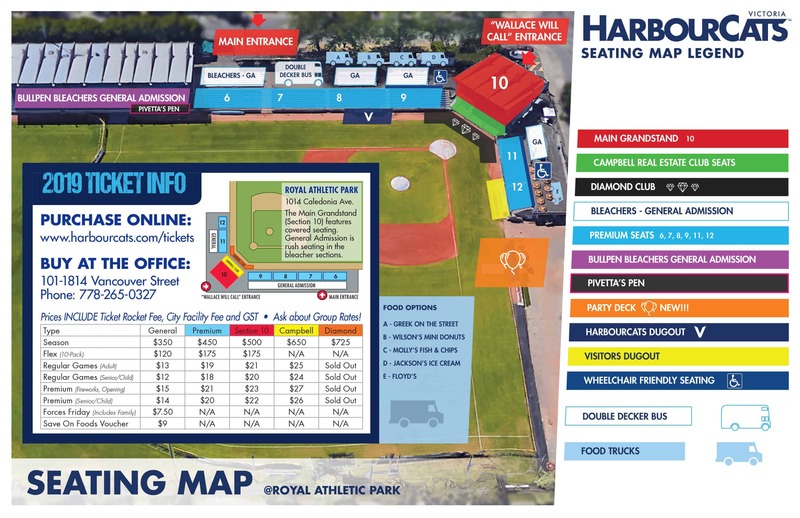 Tickets for both semi-finals and the bronze medal (4:00 PM start) and gold medal games (7:00 PM start) will be available at the Stadium box office for $10 each. Day passes for attendance at all four games are also available for $30. At Wilson’s Group Stadium Saturday night the Mavericks and Quebec played a tight back and forth affair with Quebec getting on the board first, notching a solo run in the bottom of the first when Danny Deschamps led things off with a single and eventually scored on an RBI ground out by Jean Luc Blaquiere. The Mavericks would respond in the top of the third when veteran Charlie Strandlund came through with a two-RBI single to score Duncan Blades (single) and Brodan Bydeweg (walk), taking a 2-1 lead. 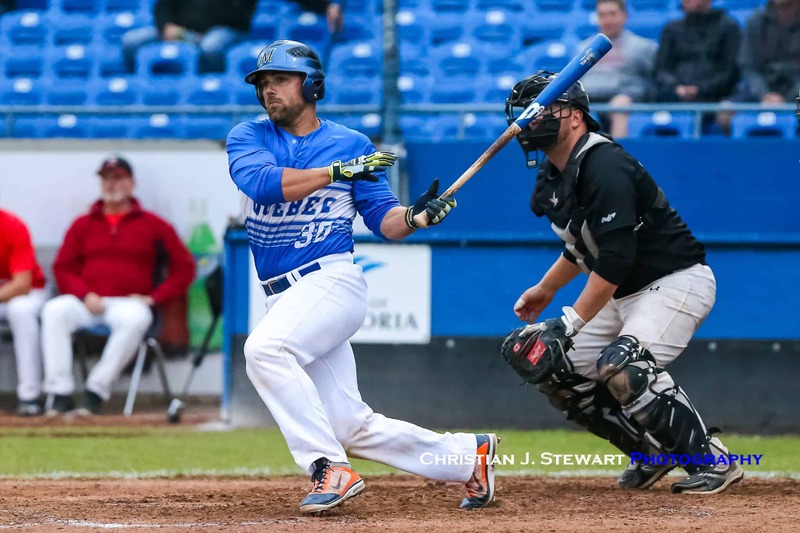 Quebec would regain the lead in the bottom of the fourth when a pair of runners would reach on consecutive errors by the Mavericks defence and then come in to score on an RBI single from Nicolas Louiseau and a 2-RBI double from Pierre Olivier Dostaler. 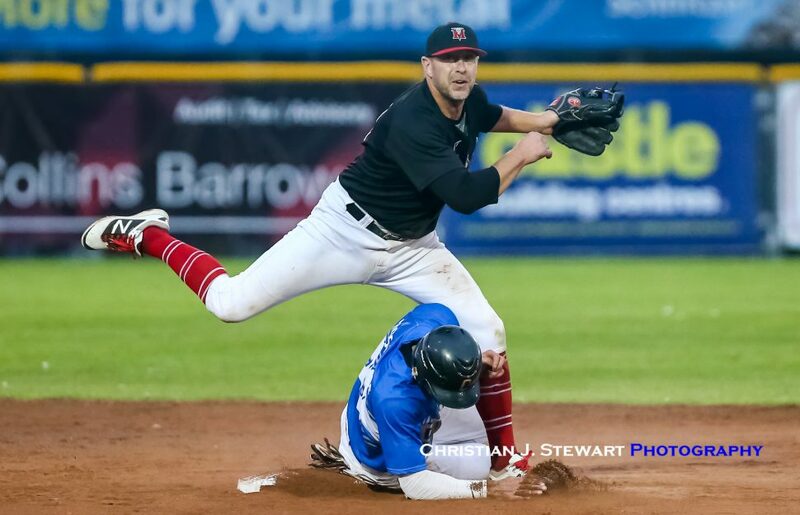 In the top of the sixth, the Mavericks would explode to knock starter Phillipe Saad out of the game and then run roughshod over the Quebec bullpen to score their eight runs. The carnage began with RBI singles from Duncan Blades and Brodan Bydeweg to tie the score 4-4. 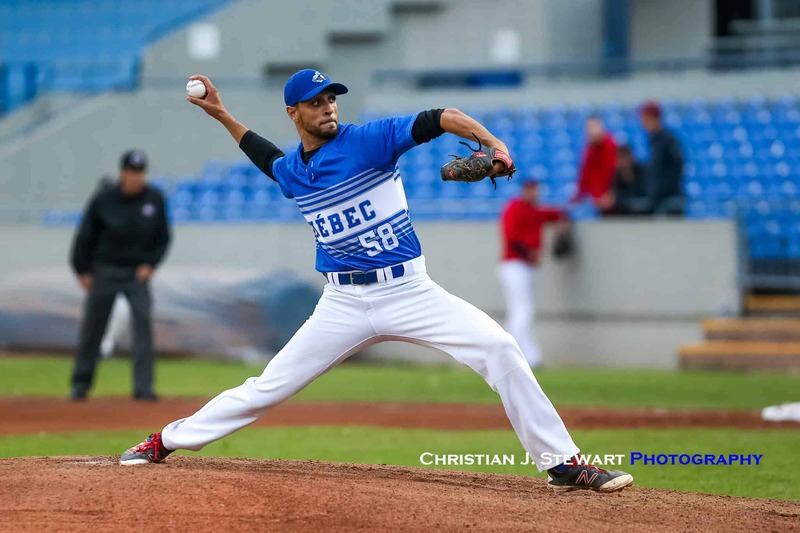 That brought in Quebec’s second reliever of the inning – Matthieu Boutin – and he was greeted on the first pitch by a three-run bomb from Lanny Burrows that vaulted the Mavericks into a 7-4 lead. Liam Goodall then added a 2-RBI single and Connor Moughtin then added an RBI single to cap the scoring in the inning and give the Mavericks the 10-4 lead. 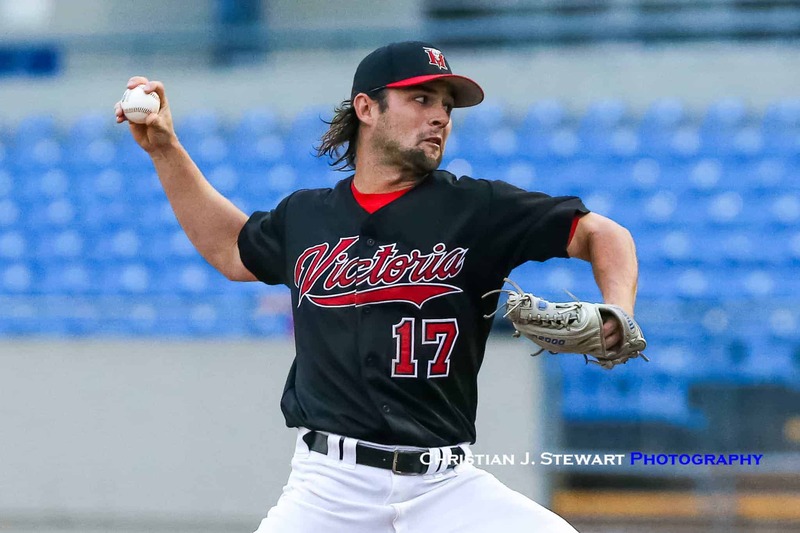 An insurance run in the seventh, on a balk, upped the lead to 11-4 and then the rest would be left up to Victoria starter Justin Clarkson, who finished off the complete game, giving up a run in the bottom of the seventh, but then closing out his complete game 11-5 win. At Lambrick Park Saturday night, New Brunswick jumped all over Ontario 2 for a run in the second and four in the bottom of the third and then rode that 5-0 lead to an eventual 6-1 win. Starter Justin Cormier stymied the Ontario offence, allowing just a single run on five hits over his six innings of work. New Brunswick’s big bats in the third inning were led by doubles by Kris Keating, Markus Coates, and Josh Dennis. Serge Vautour and Coates all managed multiple hits for New Brunswick. Mitch Lumley took the loss for Ilderton (ON2). He lasted three innings, allowing six hits and five runs while striking out four and walking one.